Back in the day, we had smartphones with physical buttons. Not just power, volume, and maybe another button on the front. Whole, slide-out QWERTY keyboards right on the underside of the phone. It was a lawless wasteland, but for those who yearn for the wild-west days of the late 2000s, [Liviu] has recreated the shortcut buttons that used to exist on the tops of these keyboards for modern-day smartphones. There were lots of phones that had shortcut keys on their keyboards, but [Liviu] enjoyed using the ones that allowed him to switch between applications (or “apps” as the kids are saying these days) such as the calendar, the browser, or the mail client. To recreate this, he went with a few NFC tags. These devices are easily programmed via a number of apps from your app store of choice, and can be placed essentially anywhere. In order to make them visible to the phone at any time, though, he placed the tags inside a clear plastic case for his phone and can now use them anytime. If you’ve never used or programmed an NFC tag, this would be a great project to get yourself acquainted with how they operate. Plus, you could easily upgrade this project to allow the tags to do any number of other things. You can take projects like this as far as you want. NFC tags are cool, but programming them to do your bidding – whether unlocking your computer, making an Arduino vending machine, or a smart home application – requires using an NFC device to program the tag over the air. An NFC tag programmable with any ‘ol microcontroller would certainly have some interesting applications, and Elecfreaks’ DNFC tag is just the thing to test out these ideas. While NFC tags are reprogrammable, reprogramming them requires an NFC controller, be that through a dedicated hardware, a phone, or an Arduino shield. The DNFC tag is reprogrammable with a microcontroller with an I2C interface thanks to TI’s RF430CL330H dynamic NFC transponder IC. It still does everything you would expect from a NFC tag – MIFARE compatible. NDEF reading and writing, and everything else – but you can program it through an Arduino, Pi, or any other board with an I2C interface. TI has an app note on using the chip inside the DNFC for automatic Bluetooth pairing, and Elecfreaks themselves have a few use cases in mind that include putting WiFi credentials on an Arduino board without putting the SSID in code and other Internet of Things™ applications. We’re thinking this is one of those devices that is eminently useful, but for something we just can’t think of off the top of your head. 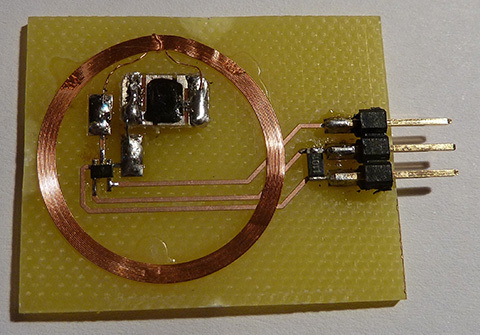 If you’ve got an idea for how to use an I2C programmable NFC tag, drop a note in the comments. Elecfreaks is doing an Indiegogo campaign for the DNFC, $13 for one. I picked one up, but it’s flexible funding, so buy it or don’t. I don’t care. Don’t you hate having to pull out your wallet or cellphone in order to pay for something? What if you could just wave your hand and transfer money that way? Well [David] did, so he decided to do something about it. He made the vending machine in his hackerspace, FamiLAB, cyborg friendly. The problem was, the vending machine wasn’t technically his to play around with… so he had to do this hack without actually modifying the machine itself — which we admit, actually makes it quite a bit more interesting! But first, why is [David] even doing this? Is he a cyborg or something? Well, not quite, but he’s quite enthusiastic about bio-tech (is that what we call it now?) — anyway, he has NFC implants in his hand, and magnets in his fingertips to give him a sixth “electro-sense”. Wanting to take the most advantage of these augmented abilities, he put together this clever NFC credit card emulator. [Per] is replacing his car stereo with a Nexus 7 tablet. It’s a great modification to add GPS, navigation, and a good music player, but [Per] wanted to pause his tunes and tell the tablet to go to sleep with an NFC tag. This means building a an NFC tag he can turn on and off, an interesting problem to say the least. The easiest way to do this is with a CMOS switch, but a chip like a 74HC4066 is overkill for a project this simple. What [Per] needed was a single CMOS switch, something he found and fabbed a board for. Now, with a press of a button, [Per] can activate his NFC tag and pause the music in his new stereo. Check out the video of this electronically controllable tag after the break.